Another busy weekend here in Edmonton. Brad was teaching a course Saturday and Sunday, I finished up the bathroom and used up the last of my yellow paint, for better or worse. Then, some errands and cleaning, a bit of scrapping, dog walks in the sunshine and yard work. 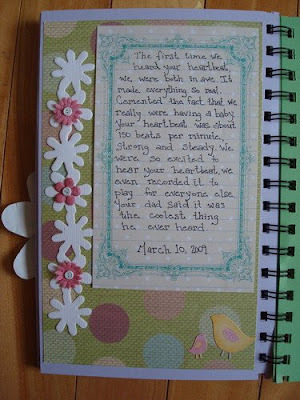 I've been working on a bit of a pregnancy journal/scrapbook lately and thought I'd show you a bit of what I've been doing. I'm having fun with it, and I think it will be a neat keepsake. Maybe even a heads up for what their own pregnancy might be like... who knows. That's looking a lonnnnggg way down the road, but still. 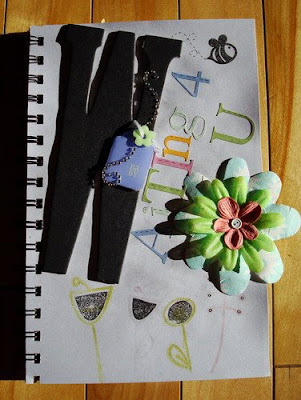 I'll try to keep posting updates of what I include in the journal as we go. We start prenatal classes this week, which I'm really looking forward to. Should be fun! 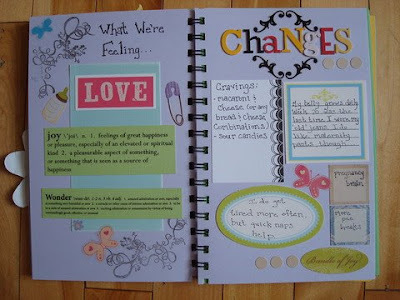 I love this journal Kelly. What a lucky baby to have you for a Mom! !